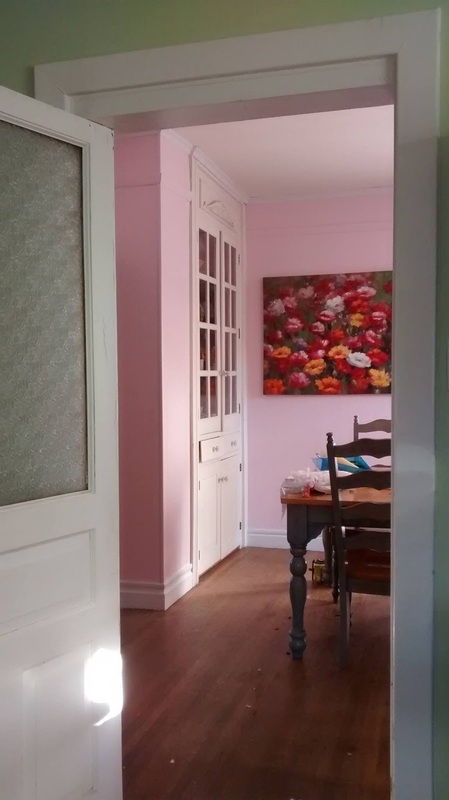 “What do you think of the pink room?” I ask my daughter. “Every time I walk into it I think, ‘Well?’, like I expect it to say something to me, to tell me why it’s so pink,” she replies. Snuggled together on a sunny Sunday morning in bed, we laugh because it is so pink. She was with me when we picked the paint color at Lowes. While I gathered a bouquet of pinks from among the paint chips, she made her own collection of beautiful, bold colors in the bottom of the shopping cart. “I’m making a color collection,” she said and I smiled to see her perusing the rainbow, listening to her own internal guide as she gathered colors. My husband said he didn’t care. Even on the way home, when I teased him with paint chips in deep shades of magenta, he held his ground. But when he opened the can labeled “Pink Taffy,” the words, “Wow! That’s PINK!” shot out. Seeing the primered walls begin to blush, even I had second thoughts. I’ve always leaned toward neutral shades in paint and clothing – tans, beiges, straight up blues and creams. “You are one of those people,” he replied. I’ve recently developed a thing for pinks and purples, oranges and fuchsia – all of the bright colors. I bought purple nail polish a few weeks back. Not long before that, a flouncy orange skirt – the color of sherbet. Walking the clothing aisles of the local Salvation Army Thrift Store, I pass by the browns, whites and blacks, heading straight for the bright delights of chartreuse, purple, pink and turquoise. I even bought a pair of pink shoes recently and I'm secretly on the lookout for a pink pair of skinny jeans. Do you remember the scene in the movie The Wizard of Oz when everything turns from black and white to technicolor? This change in me feels something like that. Or maybe like the pink Zinnia I planted on the side of our house. The first blossom opened this weekend. The plant, once just one shade of green among many, was transformed by its opening, set apart by a brilliant splash of joy. As we worked our way around the dining room, hesitancy gave way to joyful delight. “It’s such a happy color,” I said over and over again. Last month I sat in my Spiritual Director’s lovely white meeting space – a space filled with the gentle greens and browns of nature. She asked me to tell her more, to give story to the definition and I unpacked all of the lovely little things in my life, the places of grace and love, laying them out between us. “What does it feel like to be love so well?” she asked. I closed my eyes and thought. I closed my eyes and thought, felt, again. “All of the bright colors,” I replied. “That sounds lovely,” she said, nodding in recognition of the joy and love in my face. If you come to my house and see the pink dining room, sour apple green kitchen, the purple and turquoise accents, please know that what you are seeing is an extension of my heart. I am, like my daughter, making a color collection. As life deepens and widens, so also does my palette. People tell me over and over again that I’m brave to speak about my struggles with anxiety and panic attacks, they tell me I’m courageous. But for me, talking about the darkness comes naturally. For me, choosing the light, no matter what its hue, is a far more courageous and vulnerable thing to do. Sometimes brave is a brilliant shade of pink. Have you noticed changes in your color preferences over the years? What are your favorite shades these days? What color would YOU love to paint your dining room? Kelly, when my daughter miscarried at 5 five months early last year, God did a deep, deep work in their hearts of bringing them from darkness into the light.... The day after the memorial service for baby Garrison, now in Heaven, they came home and gutted the study where my son in law worked and painted. Everything came out of that dark cave like place. They transformed it into a bright, bright room with newly polished wood floors, 3 white walls and one bright, bright green. Like sherbet ice cream. It was a physical picture of what God had done in their hearts. I love that story, Jody. Thanks for sharing. "A physical picture of what God had done in their hearts" . . . what an amazing concept.